One of the most important skills I learned as a young food scientist working in product development for Kellogg was to avoid creating leftover ingredients. As you can imagine, in a factory environment having half opened bags of random food is a big recipe for mess and waste. So whenever I was developing a new formulation I’d ’round things up’ to the nearest pack size. Rather than leaving 1/4 bag of milk powder for my cereal bars, I’d try to use the whole bag. You probably haven’t noticed, but it’s something I’ve carried over to my Stonesoup recipe (not formulations!) creation. But of course, there are times when leftover ingredients are unavoidable so when I got this question, I made a note to write a blog post about it. I often wonder what to do with perishable leftovers (dairy, veg, etc), like when I’ve made a dish that required milk – which I don’t drink – and there’s a bit left. 1. Try Not to Create Leftovers. If you think the recipe will be fine, just use it up. For example, use the whole bunch of asparagus or packet of mushrooms or goats cheese. You get the idea. Most of the time it will be fine. The obvious and quickest choice when you can’t avoid leftovers. Most perishable ingredients are fine for a few days in the fridge. Which buys you time to use it. My big tip here is to keep your leftover ingredients somewhere visible so you don’t forget to use them. I keep mine on the top shelf so I see them every time I open the fridge. Cooked ingredients last much longer than fresh because the heat deactivates any spoilage enzymes AND reduces the microbe content. Cooking your leftover fresh meat and vegetables is especially effective in doubling or even tripling how long they’ll last. It’s also great because you’ll have the ingredients partially prepped and ready to throw into your next meal, meaning you’re more likely to use them. The other option is to do some ‘home food preservation’. For example some leftover basil can become a small batch of pesto, carrot tops can become carrot top pesto or the leftover milk can become yoghurt. It takes time but can be really fun. This is the last option because I find little bits and pieces tend to get lost in the freezer. It’s hard to remember you have them. However, if you’re going on holiday (like I was over Christmas) putting your perishables in the freezer (like I did) is a better option than coming home to a mouldy fridge. Like more detailed ‘Waste Avoidance’ tips? 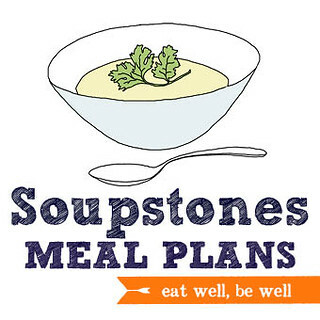 I include a ‘waste avoidance strategy’ for each ingredient in the recipes included my ‘Soupstones’ weekly done-for-you meal planning service. It’s a great resource for learning the best way to minimize your waste. + Are You Wasting These 7 Vegetables? + How Do You Know When Food is Still ‘Safe to Eat’? My waste avoidance strategy – make a curry! You can put almost anything in a curry. I use the canned curry paste. On fridays (I do groceries on Saturdays) I open can of curry paste, open a can of coconut milk and put all my leftovers in the pan. Served over rice it makes a yummy Friday night dinner and Saturday lunch! Thank you for some great ideas and recipes. I will be putting some of the leftover information into practice. I have improved greatly on the amount of waste but I can always improve.